People photography is something, which involves clicking people, and daily life around them. Be it on the street, or a busy market, shooting people is fun, hard work and sometimes an experience in itself. For years, among photographers, people photography has been a point of discussion and that too, of great interest. Where there are many new comers, who always have butterflies in their stomach, when someone talks about people photography, there are many pros in the field, who have won accolades in photographing people, and have shown the faces, which were not seen before. With the limited amount of photography which i have done in bangalore, and across the globe, I have made my favorites alongside as well. 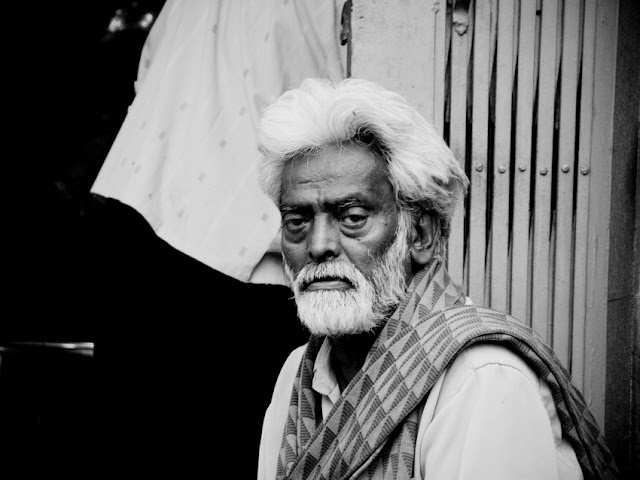 As you venture into street photography, some of those tips would be helpful, so do check them out before you head-out. 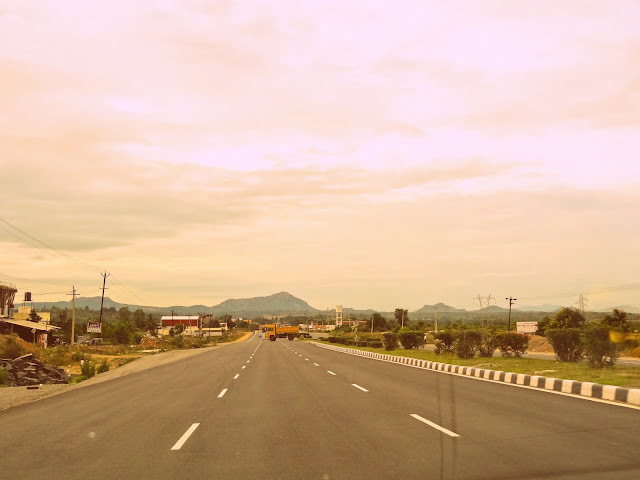 For today, here is a list of my top 5 favorite places in Bangalore, for clicking people. While these are my favorite from the point of view of having plethora of subjects, and range on offer, i would also like to suggest a thing of two about the sensitivity of people here and the amount of creativity, one can get to work with. Ofcourse, one can always argue, that creative person can shoot at a usual place and bring a different perspective. True, but i mention creativity in terms of range of subjects available for shooting. The more the options, the more fun it is. Its like the more colors to paint with, the more freedom and fun it is to paint. 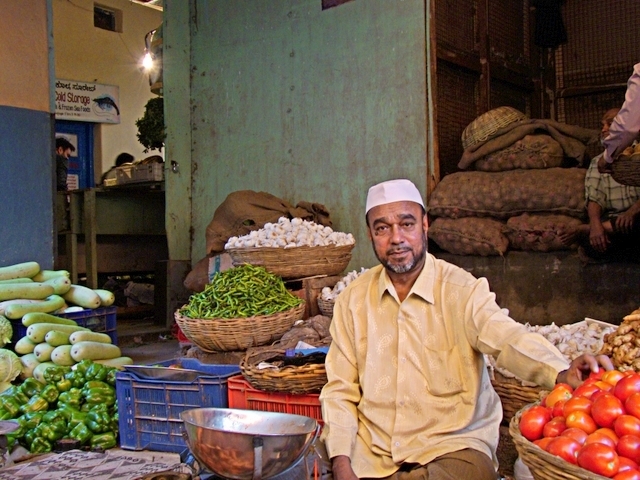 A Vegetable vendor looks on, while i shoot on an early saturday morning. Click the image to check out the photo essay. Best Time to shoot: Russell market is one of the oldest landmarks of Bangalore, and to the current report, has been closed off. I am yet to validate that news myself. But, assuming that the market is still pretty much there, the best time to shoot would be during the mornings, or late evenings. That is precisely, because in the mornings, you can shoot the beginning of the day, loading/unloading of the vegetables and flowers, which come in interesting packaging and the market in itself is something else to observe. In the late evenings, you would be able to do some low light photography, which should again be an interesting experience. A lot of portion of this market is inside, hence low light photography is always an option, even while shooting in the mornings. People & Sensitivity: This place is very well versed with photographers visiting in, so a good place to shoot. In my shootings here, most of the times people have been co-cordial, and mostly come along and talk as well. Please be cautious around the meat/mutton market adjoining, which sure may be very tempting to shoot for interesting pictures, but in past, we have noticed their dislike for someone shooting there, hence seek permission and gauge the mood accordingly, in case you plan to take a shot. Creativity Meter: I would rate it as 3/5 on the creative meter, purely, because, the low light options can make for interesting shoot, else the diversity of the subjects isn't that great. Read more about Russel Market visit in the morning. 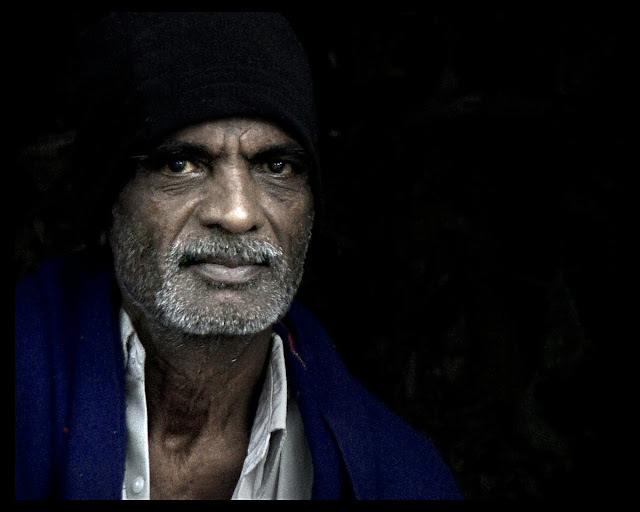 A Baba, outside the mosque, looks on, while i take his picture, after a brief chit-chat. Click the image to check out the photo essay. Best Time to shoot: KR market is mecca for photographers. Flowers, colors, trading in bulks, huge number of people everywhere and play of light in and around the market. It doesn't get better than this, as per me. The Flower sellers and vendors, and all sorts of related business, thrive in the early hours of the morning, so head out to this place early morning, and it would not disappoint you. People & Sensitivity: In terms of sensitivity, I have often found curious eyes here, purely because apart from the vendors, there are so many people, who are obviously going to get curious and intrigued by moving photographers. Still, the place offers a lot of shoot. At times, you can maintain a distance, and take some really good shots. At times, you would suddenly be among a large group of enthusiastic people, and have a gala time shooting their pictures. Creativity Meter: I rate it as my highest, 5/5, solely because as per me, all the elements which you can think off, are on your disposal, and can be clicked. the options are endless, and it is all left to your creativity, imagination and abilities, on what you can get from this market. Read more about KR Market visit and photos. 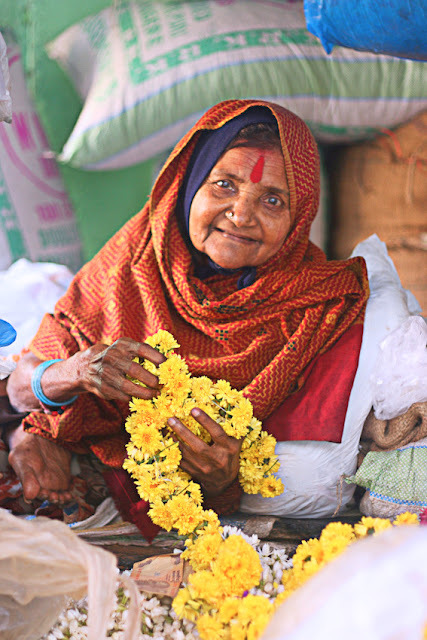 Amma (old lady) who sells flowers, looks on, while i took her pic. Click the image to check out the photo essay. Best Time to shoot: Avenue street is one of the oldest areas and markets in Bangalore. It is situated among very busy city center and hence enjoys a lot of trade. Mostly, i would suggest going in early, since there are very beautiful perspectives, mainly due to newspapers sold in bulk, milk vans, a very famous coffee board's huge mobile coffee vehicle, who stands at the very beginning of Avenue street. Starting early would also give you opportunity to click in the smaller streets, joined to Avenue street, which call for beautiful play of light and dark. People and Sensitivity: The place is always thronged by people, and hence its a mix bag place. There would be few people who would have read and seen enough, and would be fine with photographers moving around, though there have been times, where people have also objected to shooting in the areas, mainly for security concerns and usage of photographs taken. Also, particularly, i have enjoyed shooting here a lot, since i came across a lot of curious people, asking about what do we do with photos, do we come from press, and a peek-a-boo at the camera screen, brought a smile to everyone's face as well. Creativity Meter: 4/5. Mainly due to variety of subjects to shoot in this area. do check out the saree weaving thread, which was a small in-house factory, i had found while shooting in the nearby ally of avenue street. A great place to click people and lot of other elements on the avenue street. See the Avenue street report and photos from the street. Old Baba, looks on as he smoked his beedi. Click the image to check out the photo essay. Best Time to shoot: Madivala market is at a very busy junction of Madivala, in Bangalore. The market is spread across both sides of the road. I have shot here, twice, once in morning and the other time in the evening. Hence, this is a good place to experiment low light shooting if you enjoy so. The morning, shoot is alike any other market, hence nothing different. Apart from being a new and another place to shoot, Madivala market remains a good place to shoot for me. People and Sensitivity: In both the situations, i have felt that though people here have had a fairly large number of times where photographers have come down, still there are nerves, when a camera is flashed. On both occasions, i felt that either people were very conscious and didn't want to be shot or very little fazed. Though i had a good time shoot, since explaining your reasons, and being friendly always help, i would still advice, that newbies exercise caution. you can read some tips to do better at street photography here. Creativity Meter: 3.5/5 A good place to be creative, with the life at the market, flowers(not traded in large here), vegetables and patterns and small hotels and fish shops who are there by the market. Check out my visit to madivala market. 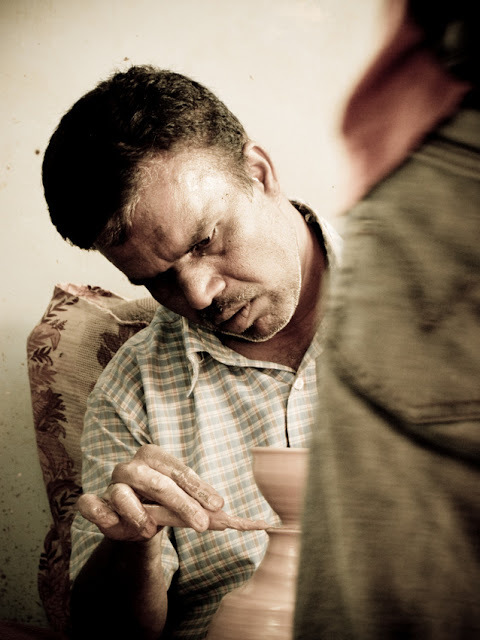 A potter, carefully shapes his creation.Click the image to check out the photo essay. People and Sensitivity: When it comes to sensitivity and how people react, i think this is one of the most receptive place i have been to. Most of the people are very comfortable around camera, and they are used to, seeing photographers coming all the times. Also, I have noticed an urge to showcase the local talent. Lot of times, people have driven me, or shown me around if they know about someone doing some interesting work. Often, they let you come inside their house, and shoot there, while some member of the family may be making pots or other articles. Creativity Meter: 5/5: There is nothing else apart from a top ranker, in my list. Perspectives, abstracts, shapes, sizes, people. There is no end to what you can shoot here. Not to miss, during durga pooja and ganesha festival, the pottery town gets very busy with making Ganesha and other idols. A Treat to watch and click. Check detailed reports on pottery tow here. So, that's my list of 5 top locations in Bangalore to shoot people and some interesting perspective. Do share with me, what you liked and what you dont! Do you have a favorite place? do share with me. I will definitely mark this post for when I visit Bangalore in September. Great tips! Thanks!